It’s not about understanding the prophecy. It’s about outliving it. Dr. Elena Burroughs’s life is spiraling out of control. Her controversial stance on dream interpretation has cost her a job, a romance, and all credibility in academic circles. Her literary agent tries to leverage the outcry into a publicity tour, which soon attracts a quirky following. Among the skeptics and mystics is a condescending scientist. But Elena finds his research holds ominous parallels with her own. A certain dream pattern has foretold every major catastrophe stretching back to the dawn of civilization. And now this dream is repeating itself in countless nightmares across the globe. Elena is confronted with a harrowing realization: the clock is ticking down to a cataclysmic financial collapse. Her desperation mounts as the prediction infiltrates her own dreams. Will this scientist become an unlikely ally—and maybe something more? Could an ancient biblical secret about the power of dreams and visions offer them an escape? This being my second time reading Davis Bunn’s work, I suppose I was expecting it to be quite similar to the previous installment, Book of Dreams. In this expectation, I was wrong, and that is a good thing. In the first, Bunn’s focus was fixed closer to the characters’ journey through trials, and used the dreams to keep the pace even and set the mysterious mood. In Hidden in Dreams, the dreams help bring about the final solution to the book, but I will say no more regarding that. The focus, as you’ll see by the end, has been about the “thriller” aspect of the novel. The characters aren’t the moral focus they had been previously, but are excellent examples of Bunn’s talent nonetheless. His writing is one of the key features that will draw readers in. Despite frequenting the subjects of medical studies, business, the press, politics, and economics, the reader is never bored by these. There is never unnecessary detail; just enough relevant information is given for the reader to understand (and care about) what is happening. While the dreams are definitely the focus of this novel, they slow near the middle, and so does the reader. They recover, and bring the interest with them, and certainly never allow the thought of quitting the book, but spark some boredom once or twice. 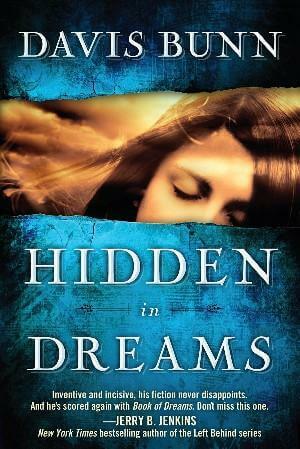 Hidden in Dreams is a novel abounding in wonderful writing and textured characters, and gives a good name to Christian thrillers, but didn’t hold my attention firmly throughout.